USDA audit says horse transport violation penalties meaningless. iFH says this is the reason horse protection laws must have criminal penalties, not civil penalties that result only in hand slaps and uncollected fines. Our review of the slaughter horse transport program found that APHIS needs to improve its controls for ensuring that horses being shipped to foreign plants for slaughter are treated humanely. 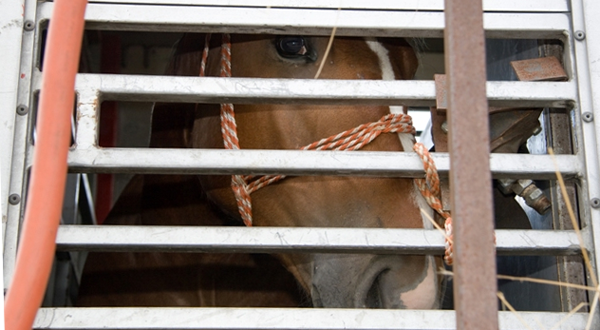 At present, APHIS does not deny authorization to individuals with a record of inhumanely transporting slaughter horses to ship other loads of horses, even if unpaid fines are pending for previous violations. Regulations simply do not address denying this authority, and so APHIS provides the authorization, regardless of the owner’s history. Without regulations or legislation to establish more meaningful penalties, owners have little incentive to comply with regulations, pay their penalties, and cease inhumanely handling horses bound for slaughter. This is an example of why horse (and any other animal) protection laws must have criminal penalties, not meaningless civil penalties that result only in hand slaps and uncollected fines. It is also the reason the Int’l Fund for Horses does and will not support legislation with civil rather than criminal repercussions, such as H.R. 305 (Horse Transportation Safety Act of 2009) which is another useless piece of horse protection legislation. Here we 9 years since the above comment by Linda Horn and CTESA continues unabated. How many horses have crossed since then? Nearly one million, I’d guess. Scanned the report. Another “unfunded mandate”!!! What’s going on in Washington besides NOTHING??? I wonder how much money they’re spending on horse “soring” vs. slaughter? Much more extensive info on “soring”, including illustrations. And specifically how much money has been “transferred” to which other agency activities? In order to have any chance of controlling horse slaughter transport violations, the USDA MUST cut down on points of entry to Mexico and Canada. It only makes sense, but since when does our government make sense? Does the U.S. currrently allow slaughter-bound horses to be transported through any and all border checkpoints? All transport should be STOPPED until this report has been addressed, Congressional hearings have been held, and the USDA has PROVEN they are enforcing their own regulations. I wonder how many members of Congress have any idea this report even exists?